Open the report design (.4rp) file. In the Report Design window, define Stripes in the design document, one for each total. Use Tool Box elements to hold the values, for example, Decimal Format Boxes. In the Structure View, drag each Stripe and drop it onto the trigger node for the corresponding group trigger. This will position the Stripe as a child of the trigger node and display it at the end of the group. It is important that the total stripes are the last child element of a report trigger node. 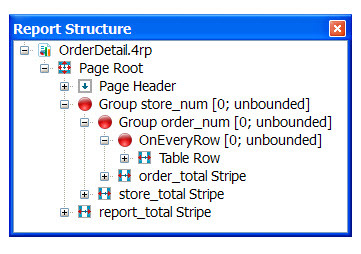 In this example, the order_total Stripe is the last child of the Group order_num, the store_total Stripe is the last child of the Group store_num. The report_total Stripe was dropped onto the Page Root, the main page for the report. This positions the Stripe as a child of the Page Root, and places it at the very bottom of the child list for that trigger. On each change of data, the specified data for every corresponding row will print, and the appropriate Stripe will print after each change of Group. The report_total Stripe will be the last thing to print out on the report. The values of any data objects in the Stripe are taken from the immediately preceding row of data (the last report line of the container for onEveryRow trigger).